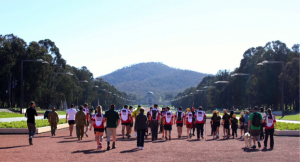 Soldier On’s mission is to work side by side with those who serve and protect Australia, and their families, HELPing them to secure their future. Health and wellbeing – Psychology, social activities and programs, sporting activities and programs and service initiatives. Employment – Transition services, employment support, career development assistance. Learning – Education and training programs, vocational training. Participation – Social activities and programs focused on connections with family, friends and the broader community, volunteering and sports programs. In order to achieve this mission, Soldier On has a team of amazing staff who dedicate their time to delivering services directly to serving those who have served, and their families. We have centres in the ACT, Concord NSW, Parkville VIC and offices in Perth WA, Adelaide SA, Brisbane QLD, Newcastle NSW, and Albury NSW. Our volunteer network and the generosity of the community allows for activities and events to be held across the nation and support many service personnel and families outside of city areas. Soldier On is not funded by government. It is thanks to corporate sponsors, trusts, philanthropic support, and the generosity of the community, that enables us to provide services to those who need them. At Soldier On, we continue to adapt to meet the needs of service personnel and their families. This means providing services for the entire family, in areas that truly support connection with the greater community, whether participants are still serving or have separated from service. Soldier On is focused on three key areas. Social activities, employment and education, and psychological support. Whether our participants need to access services in one or all three areas, our staff are here to help them connect with others and to secure their futures. Service personnel and their families are welcome at any of our centres across the country and can engage with staff on the ground to find out more about our services. We can also provide some of our services remotely, via phone and online resources.